Picture found on Google Image Search. I hear things like this all the time, from bloggers to guildies, pugs and trade chat, from level 1 to level 80. There are tons of people saying the same thing, that World of Warcraft has gotten far too easy. This is usually in reference to the raids, but can also refer to the heroics. Often times I find that these same people are sabotaging themselves. They want harder heroics/raids and yet they do everything they can, sometimes without realizing it, to make the heroics/raids easier. First off the one role I see complain about this more than any other is DPS. DPS has ALWAYS been and will ALWAYS be the easiest part of any raid/heroic/anything. You generally have to know where you need to be standing, and in what order to hit your buttons. If you are complaining about the ease of WoW and you are a DPS, try a harder role, such as healer or tank. If this is your first time playing those roles and you just respecced your level 80, expect to be yelled at as you destroy run after run until you get the hang of what it is that you are doing. Another way people seem to shoot themselves in the foot is reading strats. Now sure, if you just got into a raiding guild and they expect you to know the strats of a fight then you need to read up on it if you expect to stay with them. On the other hand if your entire raid is complaining about how easy WoW is now, try having them go in blind to the next raid, whether that be ICC, Ruby Sanctum or something in Cataclysm. Go in blind, don’t read any strats and do what you are supposed to do: FIGURE IT OUT AS YOU GO! The last pitfall, and probably the worst if you want to experience a harder, more exhilerating raiding experience: Don’t use addons. Seriously. Some of them might be fine, but anything that changes the way you actually play the game is a no go. The biggest offender here is Deadly Boss Mods. Imagine your entire raid doing a fight without knowing ahead of time when the silencing shout is coming, or when adds are coming. Think about how much you rely on DBMs and then figure out how much you are screwing your experience if you really want a challenge. Try playing this game the way you are supposed to. Go into a raid with everyone blind. No strats, NO mods, nothing. Try Shift-1 to Shift-6 or whatever to change your bars again. Go back to guessing and paying attention to the boss to figure out what he’s going to do. 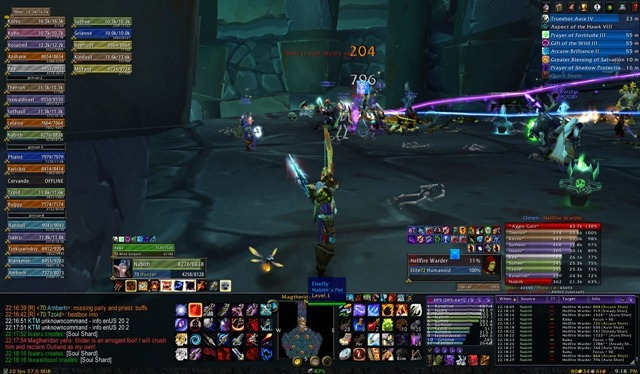 Use the default Blizzard raid UI. Try all of that and then tell me if raiding is too easy. If you still think so, then it’s a valid complaint. If not you can’t expect Blizzard to cater to mod users and make it too hard for people playing the game the way they are supposed to be. This is exactly why Blizzard won’t allow mods for their next MMO, I’d bet money on it. It’s also why most other games don’t allow addons, at least to the extent of Blizzards addons.